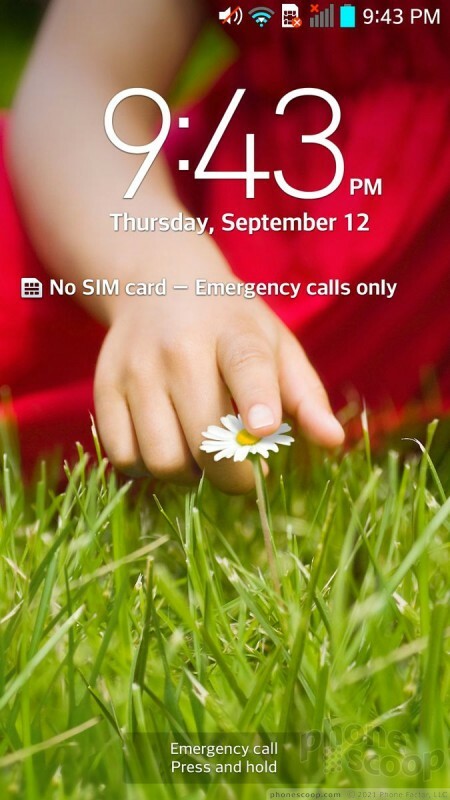 The G2 runs Android 4.2.2 Jelly Bean with LG's user interface customizations on top. To start, the lock screen is fully customizable. It offers up to five shortcuts, all of which can be changed or deleted. You can also customize which clock appears on the lock screen, and whether or not weather data and other alerts are sent to the lock screen. A double-tap to the phone will wake the lock screen, so you can see the weather and alerts without unlocking the device. If you choose to set a lock for the G2, the weather and alerts are still visible, but you have to unlock the G2 before you actually interact with them. 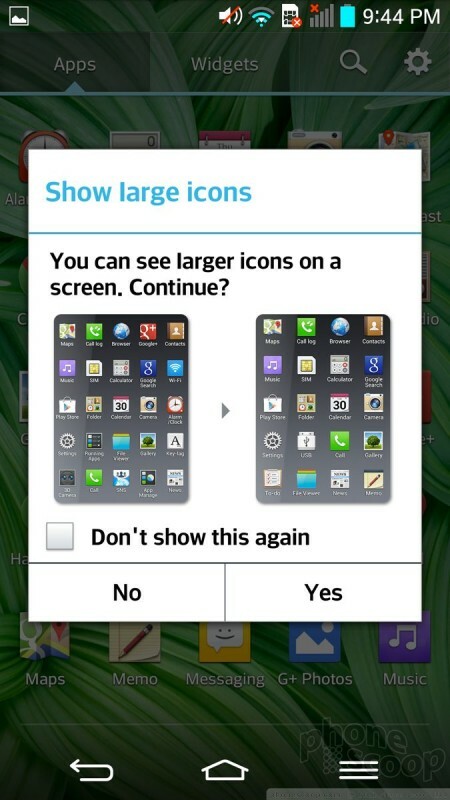 There are six home screen panels for customization out of the box, but you can delete or add screens if you wish. There are a multitude of widgets on board and LG was sure to call attention to its newest apps with full-screen widgets that I removed straight away. The pull-down notification shade provides shortcuts to control the wireless radios as well as brightness, rotation, sound, and LG's QSlide apps. These controls, however, take up half the display, leaving less room to view the actual notifications in the notification shade. I found that to be a bit of a backward step. 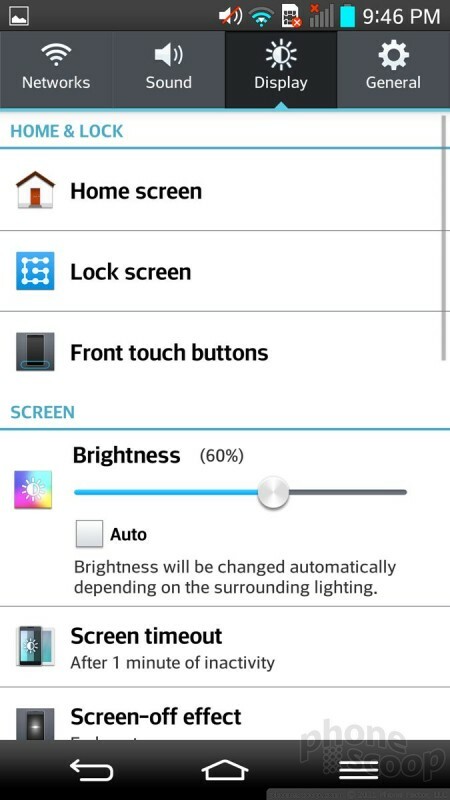 LG was considerate in that it allows us to choose which toggles appear in the notification shade, but not whether we wanted any there in the first place. The main menu is a grid of apps. LG offers plenty of flexibility as far as customizing it is concerned. 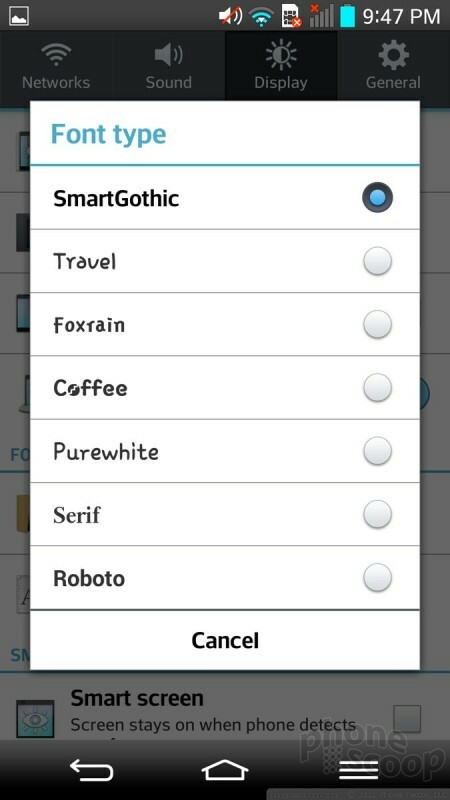 You can view the main menu with large icons (default) or small icons to fit more apps on each individual page. 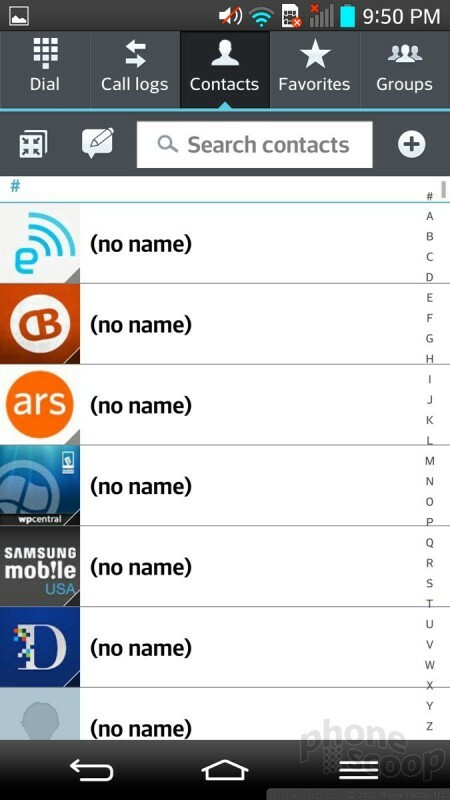 You can sort apps alphabetically or via install date. You can't, however, view them in list form. Apps can be hidden, and, even better, there's a tool that lets you delete all the carrier-branded apps right from the main menu page in one fell swoop. Speaking of which, AT&T has plenty of their own apps and services on board. Here's an interesting bit of customization: Since there are no physical home screen buttons, the Back, Home, and Menu buttons appear and disappear as needed at the bottom of the screen. The cool bit is, LG allows you to pick from about 6 different control button configurations, including some three-button and some four-button configurations. 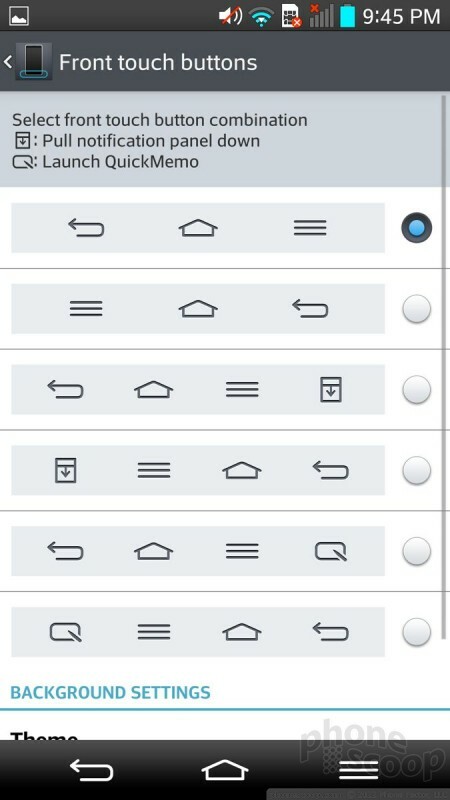 Some have the Back button on the left, others have the Back button on the right, and so on. The four-button configurations add in a tool that lets you access the notification shade without reaching for the top of the screen. Cool. There's a new multitasking tool from LG called Slide Aside. It's an optional way to handle multiple open apps at the same time. 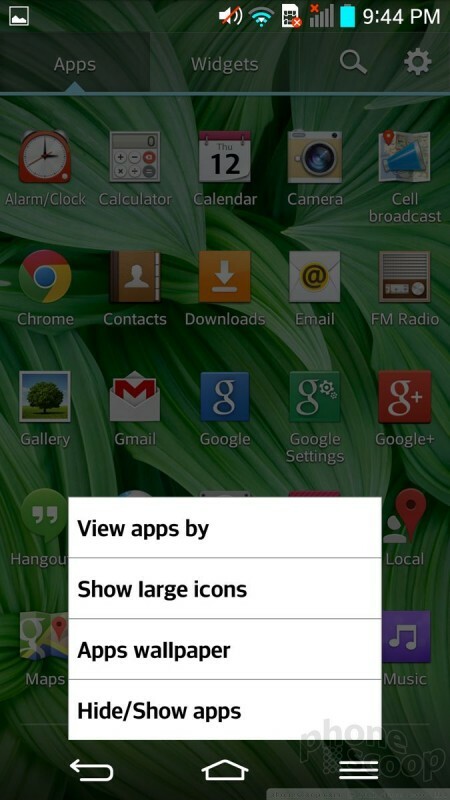 Essentially, you use a three-finger gesture to push full-screen apps left to set them aside for later use. It works almost exactly as multitasking does on Apple's iPad. I find, for a phone, three-finger gestures to be ridiculous. Further, Slide Aside did not work consistently. I recommend using the home button (press-and-hold) to jump between apps. As far as performance goes, well, the LG G2 is one of the first smartphones to ship with Qualcomm's top-of-the-line mobile processor on board, the Snapdragon 800. The 800 is a quad-core monster that promises the best in terms of both computing power and battery life. After a week with the LG G2, I can say that the 800 lives up to its promise. Not only was it incredibly fast, but 3D games looked incredible, and battery life was quite good to boot, given the size and features of the phone. The phone and contact apps work exactly as they do on other LG smartphones, such as the Optimus G Pro and F3, but there are some useful extras on the G2 that some people might like. 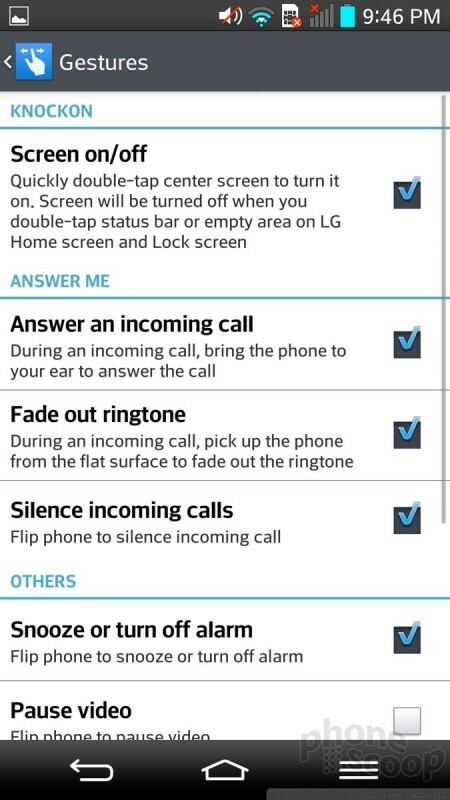 LG has added software that might make it easier to answer phone calls. With the G2, simply taking the phone out of your pocket and raising it to your head will connect an incoming call. This feature, called Answer Me, can be turned on or off. I had mixed success with it. Sometimes it answered the phone too soon, and other times it answered the phone too late. It answered the phone as the G2 reached my ear only about one-third of the time. A couple of times it didn't work at all. The G2 can also be set so that calls (or alarms, etc.) are silenced when the phone is flipped over. This silencing feature worked perfectly. There's one more neat little addition to the phone functions worth mentioning here. LG has made the phone app one of its Qslide apps (sort of miniature apps). There's a button in the phone dialer that minimizes the phone app, but leaves it open and running on top of other apps. This means you can always have the phone controls front and center while performing other tasks. 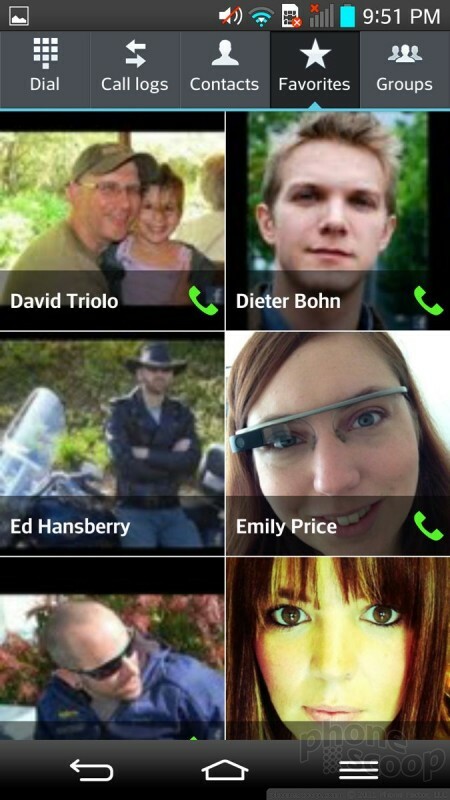 The contacts application is as powerful and customizable as ever. There are the usual home screen shortcuts for quick access to select contacts, as well as a nice widget for a collection of your favorites. The bigger widget lets you access your top nine contacts and gives you a spiffy UI for interacting with them on the home screen. 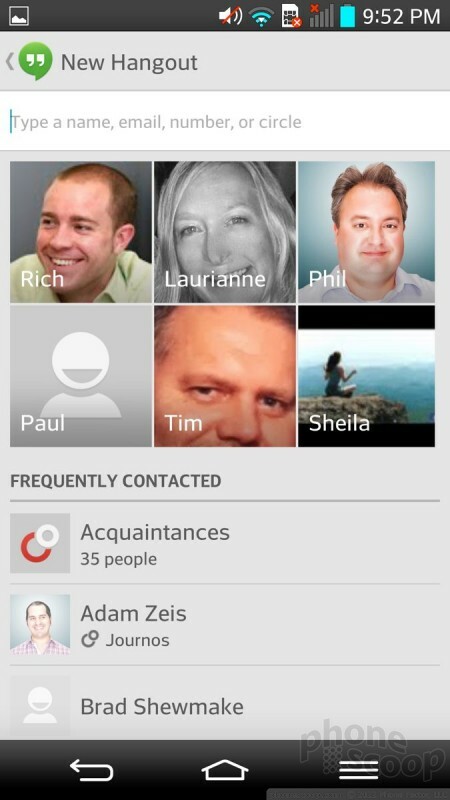 Within the contact app itself, you can choose which accounts it syncs with and/or displays, how contacts are arranged, and easily lump them together into groups. As with the phone, the contact app can be minimized as one of the QSlide apps and left running on the home screen or on top of other apps if you want. As far as messaging goes, the G2 doesn't deviate from the Android norm. It houses all the typical Google apps: Gmail, email, SMS/MMS, Hangouts, and Google+. 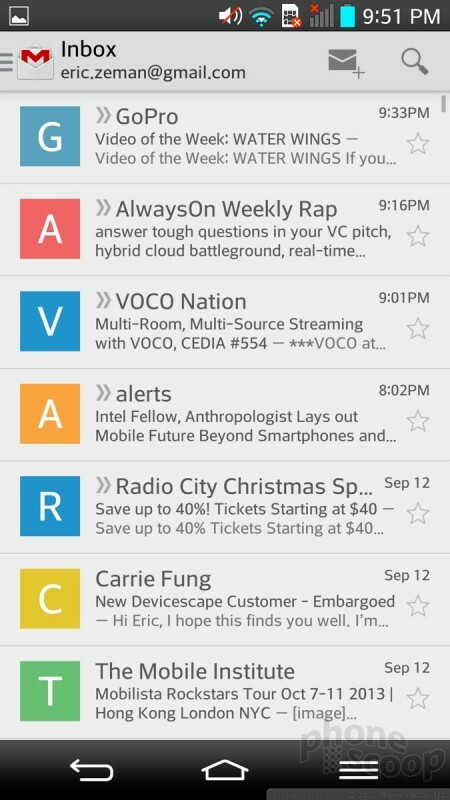 All of these apps functioned as designed and are well-built tools for communicating with others. 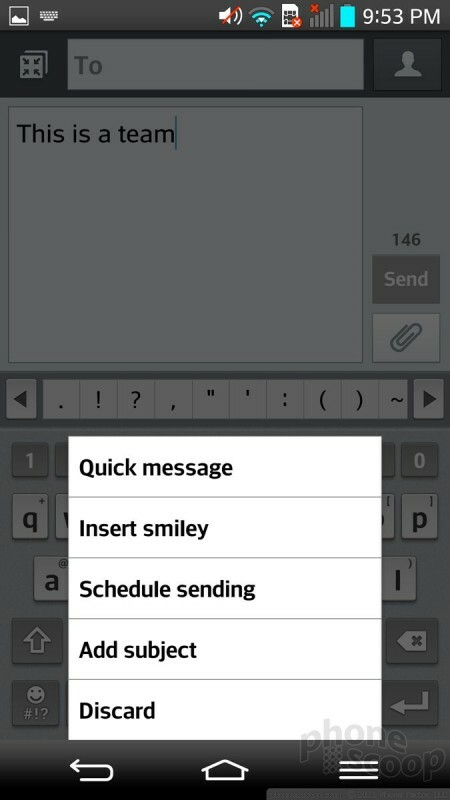 The text messaging app is another app that LG added to the QSlide capable apps. This is probably the best Qslide app possible. Do you sometimes get into lengthy SMS conversations but are trying to get other things done on your phone? This is the answer. Neither the native Facebook nor Twitter apps were pre-installed on the AT&T version, so you have to grab them from the Google Play Store yourself. Thanks to Android's built-in social networking and sharing tools, it's never hard to share anything from the G2 to the outside world. 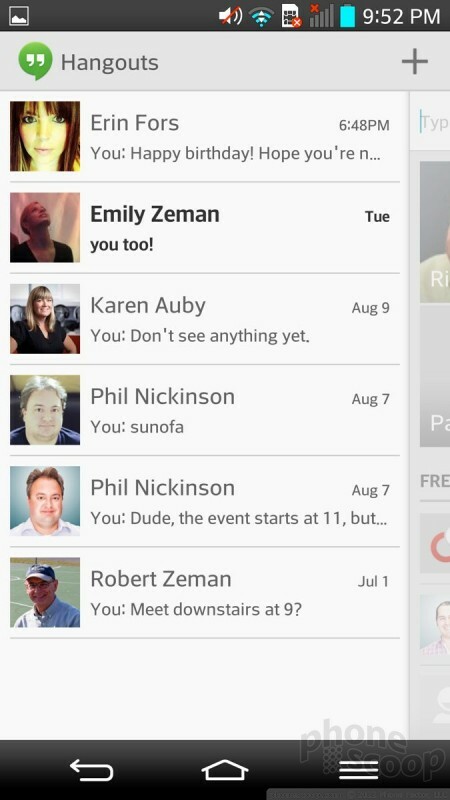 Lastly, AT&T's catch-all messaging app is available. This app can work with AOL and Yahoo (it doesn't work with Skype), as well as SMS and visual voicemail. AT&T's messaging app is a bit clunky as far as I am concerned, but it can be helpful if you like to see everything in one spot rather than spread across various apps.